The Him Parivesh Environment Protection Society today alleged that the cement grinding and blending unit of Jaiprakash Associates Limited at Bagheri continued to pollute the area as massive toxic dust was visible, especially early in the mornings. Despite agreeing to provide a fresh environmental plan and structural stability certification for having raised two additional floors in violation of norms, the promoters of the Jakhu aerial ropeway have failed to furnish these documents even as the extension period sought by them has expired. Dharamsala is once again gearing up for an IPL season- next week. The small hill town will, this time around, host two IPL matches on May 17 and 19. Bio diversity is under constant threat in Himachal Pradesh due to manmade factors like the setting up of cement plants, construction of highways and hydel projects in high hills. The Diocese of Amritsar, Church of North India, today alleged that attempts were being made by the land mafia in connivance with politicians and bureaucrats to grab church properties in Himachal. Chief Minister PK Dhumal today said the credit for best health indicators of Himachal Pradesh at the national level went to dedicated and able health professionals, including nurses. The 130-year-old Viceregal Lodge complex housing the prestigious Indian Institute of Advanced Study (IIAS) here is emerging as a major tourist attraction following its restoration. Chief Minister PK Dhumal today exhorted litterateurs to contribute significantly in preserving the rich traditions of the state so as to make Himachal Pradesh a centre of art and culture. Chief Minister PK Dhumal presents a Yuva Shikhar Sahitya Samman to Dr Bharat Prasad, writer from Meghalaya, at a function organised by literary organisation Shikhar in Shimla on Saturday. Education Minister ID Dhiman has said 40,000 students getting high marks in the matriculation examination will be given Akash tablets free of cost to promote IT education in the state. All farmers who work under the MNREGA for 15 days become entitled for benefits of the National Rural Health Insurance Scheme for a year and they should come forward to work under the same so that they would generate some income directly or indirectly from these projects. The Farmers and Mazdoor Sudhar Sabha, which has been battling for ownership rights of trees grown on their private land for the past many years, has appealed to Chief Minister PK Dhumal to follow the Punjab Government which had succeeded in restoring farmers’ rights by excluding 65,670 hectares of private areas from the Forest Working Plan (FWP). The Indian Council of Medical Research (ICMR) has decided to establish a new field unit of NIRRH-ICMR, a first of its kind in this hill state, and Dr Rajendra Prashad Government Medical College (DRPGMC) at Tanda has been selected for this research unit. It will be looked after by the National Institute of Human Reproduction and Research, Mumbai. Accused Sumit Kumar involved in the murder of a tribal girl of Mahliyat village in the Pangi tribal valley of Chamba district was remanded in police custody in transit for five days by the court on Thursday. Hundreds of students and members of a spiritually-oriented service mission, today took out a rally through the main markets of the town creating awareness among people regarding the menace of female foeticide. Two persons were killed on the spot and 28 others injured, two of them seriously, when a private bus coming from Jogindernagar in Himachal Pradesh overturned and fell into a village pond near Raipurrani in the wee hours today. The state government had introduced various industry-related courses in its various technical education institutes to help enhance the employability of the state’s youth. According to government data, more than 45,000 students have enrolled in such courses. A workshop on the Green India Mission was organised here on Thursday by the Hamirpur Forest Circle, which was presided over by Sanjeeva Pandey, nodal officer of the mission. Two women, one each from Mandi and Kangra districts, succumbed to their burn injuries at the DRPGMC Tanda today. They had received burn injuries in two different incidents and had been struggling in the hospital, the police said here today. Unemployed JBT teachers, who are on a chain fast at the district headquarters of Chamba since May 4, have opposed the condition of the teachers eligibility test (TET) enforced in the recent past on those JBT teachers who have already completed their training. CM PK Dhumal today inaugurated a six-day-long book fair of National Book Trust (NBT), “Sahitya Chopal”, organised in collaboration with the Himachal Kala Sanskriti and Bhasha Academy, at Indira Gandhi Sports Complex here. A 25-year-old youth died of poisoning at DRPGMC Tanda today, the police said here. The issue was keenly discussed during a meeting convened by the society at Nalagarh today where Dukhiya discussed the issue relating to gross violation of pollution-related norms in the Baddi-Barotiwala-Nalagarh Industrial Area at length. It was decided that Him Parivesh would regularly monitor the air quality and suspended matter with the help of local people. Taking support from Community Environmental Monitoring Centre, a Chennai-based toxics watchdog group, Him Parivesh would keep track of pollution levels and submit regular reports to the government as well as the Himachal Pradesh High Court. “We think the pollution control board has neither the will nor the capacity to monitor pollution levels in the area,” added Shweta Narayan of CEM, Chennai, while expressing concern at the poor regulation by the state pollution control board. “In fact, we will track the water and air pollution levels in the entire BBN region and release a detailed state of the environment report within six months to expose the negative impact that the uncontrolled industrial growth has had in the region,” added environmental activists Rahul Saxena and Manshi Asher, who were also present at the meeting. Him Parivesh activists alleged that the “single-window clearance” mechanism was a corrupt system of approving industrial set-ups and there was no transparency on the nature and capacity of the investments. Citing the Jaypee example, they said the real investment details were revealed only after the plant became operational and by then, it was too late to take action. The group also pointed out that the Supreme Court order of 2003 on the declaration of hazardous chemicals and wastes on boards displayed outside factory premises stands grossly violated in the BBN Area. Him Parivesh has resolved to compile information on all companies violating this order and make a submission to the Supreme Court in the matter. It was in the first week of March that the Town and Country Planning (TCP) Department had asked Jagson International Pvt Ltd to furnish some additional documents in case they wanted the government to take a final view on their project. Even though the promoters had agreed that they would provide the certification and other documents within 15 days, it was over two months but the formalities were yet to be completed. The company had sought time till April 20 to furnish all the documents, but even now, the Municipal Corporation (MC) and the TCP are waiting for their response. In fact, the MC has written to the TCP, pointing out that the promoters had, till date, not fulfilled the conditions laid down by the government before examining their case. The aerial ropeway project, which has remained embroiled in one controversy or another, has been pending as the promoters had raised 13 storeys against the approved 11 floors. A high-level committee had been constituted to look into various aspects and place before the Cabinet its viewpoints. “We are yet to receive the structural stability report and fresh environmental plan from the company even though the deadline has elapsed,” said a TCP official. The TCP Department, at a meeting held here on March 7, had asked the promoters to furnish the documents so that a final view could be taken by the government. It is learnt that the promoters had assured that within two weeks, they would complete the formalities, which could then pave way for the project to start operations. TCP sources said the department would now write to the Secretary, TCP, to take a decision on the further course of action, as the promoters had not complied with the conditions laid down for consideration of their project. The TCP Department has said the stability certification must come from experts in the field so that there is no compromise on the safety aspect. The promoters have also been asked to submit a fresh environmental plan because of raising of the building’s height. Another condition imposed on them was that they sign an indemnity bond so that in case of any mishap, they provide compensation and bear all damages. Dharamsala is once again gearing up for an IPL season- next week. The small hill town will, this time around, host two IPL matches on May 17 and 19. Kings XI Punjab, the host team, will clash with Chennai Super Kings on May 17 and Delhi Dare Devils on May 19. The IPL spell is likely to trigger a boom for local business. 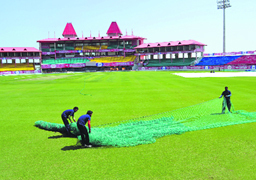 About 20,000-capacity Dharamsala cricket stadium is likely to attract thousands of tourists to the town next week. Local tour operators say many tourists have planned trips to Dharamsala in keeping with IPL match schedules. The IPL will bring relief to local tour operators as they are facing a lean season due to inclement weather and low temperature prevailing in lower areas. However, with the Assembly elections due at the end of the year, the IPL is also likely to heat up political activity in Kangra, supposed to be politically the most significant district of the state. The Congress has already made the HPCA and organisation of IPL matches its main agenda when it comes to hitting out at the ruling party. Since the HPCA is being headed by BJP MP from Hamirpur Anurag Thakur, the Congress has planned to target the organisation as its election agenda. Congress leaders have already questioned the sponsorships given to the HPCA by the JP group of industries, the land given on lease for HPCA hotel, waiver of entertainment tax for IPL matches and not charging expenses for providing security for the IPL matches. HPCA spokesperson Sanjay Sharma said a hotel was a necessity for organising international cricket matches at the Dharamsala cricket stadium. “We tried to encourage local hoteliers to develop a five-star hotel facility for the HPCA. However, no one came forward. So we had to construct our own hotel,” he said. About the security cost not being charged from the host team Kings XI Punjab, the government has been maintaining that Dharamsala was a remote location and the team had spent a lot to shift its infrastructure for hosting matches here. They have been maintaining that the hosting of IPL matches has brought Dharamsala on the world tourist map and given a boost to tourism in the area. Dharamsala is already short of parking places for the existing traffic. The IPL matches bring in thousands of additional vehicles. The PWD has created a new parking lot near the stadium to compensate for parking in the Sports Authority of India stadium, that has now been converted into a synthetic track. Sources here said the police was planning to stop maximum vehicles in Sidhbari. Bio diversity is under constant threat in Himachal Pradesh due to manmade factors like the setting up of cement plants, construction of highways and hydel projects in high hills. Because of largescale habitat destruction by power companies and cement plants, human-wild animal conflict incidents have become very common in many parts of the state. At present over 250 small and major hydel projects are under construction in the state which have played havoc with nature. Large-scale deforestation, blasting and excavation of tunnels by power projects and cement companies have forced hundreds of wild animals like leopards, wild bears, black deer and wild goats to leave their natural habitat and shift to low-altitude thickly populated areas. In such circumstances “human-wild animal conflict incidents” have become quite common and many times these animals are even seen on highways and killed by speeding vehicles. Till date no steps have been initiated to protect the natural habitats of these animals in the state. The Forest and Environment Department has not drawn any plan or policy in this regard. Wildlife experts are of the opinion that if the state government fails to initiate timely action, it will have serious consequences. However, the Veterinary and Animal Sciences Department of HP Agriculture University, Palampur, has come forward to address this problem. Veterinary students are being trained to handle and protect these animals and later leave them in their natural habitats. Students are being given hands-on training in capturing and rehabilitating such animals. They attend to such animals at the rescue centre at Gopalpur from where they can be released if found fit to survive on their own, otherwise they are provided health care and managed at the centre. Talking to mediapersons, Dr RS Kishtwaria, Wildlife Specialist, said here today that veterinary students were being trained to handle large felids like lions, leopards and other small carnivores, black bear, birds, snakes and deer. Recently, students captured a large snake from a guest house and released it in a forest after taxonomic and biometric studies. He said students got sufficient exposure to handle a situation independently. Many times they were contacted on the mobile by locals to resolve the crisis. “It is a life-time experience to touch a lion, leopard or snake for the first time. Now we are confident to handle any situation for the conservation of faunal biodiversity of our state,” stated one of the students. A delegation of Christian priests, led by Bishop Pradeep Kumar Samantaroy, today met Chief Minister PK Dhumal to seek his intervention to ensure the safety of church properties in the state. He brought to his notice the incident of trespassing, vandalism and theft by the land mafia at Khyber House, Upper Bakrota, Dalhousie. Talking to mediapersons, Samantaroy said about 30 persons entered the church property in Dalhousie and stole furniture, records and other goods on the night of May 11. “This property has been in the possession of the church for the past more than 100 years and the campus is used by the Diocese of Amritsar, Church of India, for holding religious meetings, workshop and conferences,” he said. He sought the intervention of the Chief Minister in bringing the culprits to book and registeringpolice cases against them. “We met the Chief Minister today and submitted a memorandum seeking protection of the church property and the safety of the Christian community in Himachal, especially in the backdrop of the vandalism indulged in by hooligans,” he said. He said though the police had registered a case, no arrests had been made till now. “Miscreants continued to vandalise the campus in the presence of the police and our staff there are not allowed to enter their own quarters,” he said. He was addressing a state-level function of the Himachal Pradesh Chapter of Trained Nurses Association of India on the International Nurses Day here today. He said the successful implementation of various schemes such as Atal Swasthya Sewa, Matri Sewa Yojna and Beti Hai Anmol were some of the major schemes. He said Himachal had successfully launched a Child Mother Mobile Tracking Programme to monitor the health of the mother and the child after one month of pregnancy which was not only ensuring medical care, but also checking female foeticide. Suresh Bhardwaj, MLA, said Himachal Pradesh had emerged as a role model in health sector in the country due to the combined efforts of every health worker. He said the cadre strength of nurses which was only 600 had been increased threefold to 1,800 during the BJP regime. KANGRA: Nurses Day was celebrated at the Guru Daronacharya College of Nursing at Baroi today. 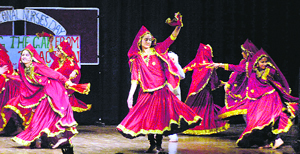 A cultural programme was held at the college hostel campus. Dr RL Sharma, former member, HP Public Service Commission, said on the occasion that the International Nurses Day was celebrated around the world every May 12, the birth anniversary of Florence Nightingale, and nurses commemorated the day with various activities throughout the world. This year’s theme for the day was “Closing the Gap: From Evidence to Action”. BL Marhatta, president, Guru Dronacharya Society, said while Nightingale was best known for her work during the Crimean War in 1854, some of her most valuable contributions came afterwards. He said she returned to England as a national heroine, she deliberately hid from public life and lived in seclusion where she worked non-stop. He said her first major works were two books published in 1859, “Notes on Hospital” and “Notes on Nursing”, detailing her views on health-care reforms gained from her experience during the war. Jobin K Kuriokose, Principal of the college, urged students to learn from the life and working of Florence Nightingale to serve the society in the right perspective. One of the few unspoilt green areas in the “Queen of Hills”, the magnificent heritage complex has been drawing more and more tourists since it was renovated under the plan for restoration and adaptive reuse. The number of visitors increased from 96,984 in 2009-10 to 1,26,292 in the following year. In the 2011-12 fiscal, 1,47,883 tourists, including 8,605 foreigners, visited the complex. The historical importance of the complex apart, the lush green surroundings with thick forests and sprawling lawns and a botanical garden beckon tourists to the hill station, large parts of which have been transformed into a concrete jungle. The complex has been spared the onslaught of builders as it is under the control of the Central Government. The increased tourist flow is also fetching revenue to the institute by way of entry fee and the sale of books, souvenir and other items. The income from the sale of entry tickets to tourists and parking of vehicles shot up from Rs 31,12,000 in 2010-11 to Rs 38,55,845 last year and the total income, including through the sale of books and souvenir, rose from Rs 44 lakh to Rs 70 lakh, which is significant. 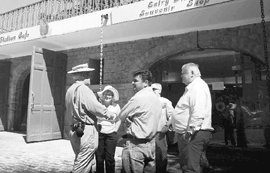 While restoration work on the main edifice has been going on for a long time, it was the renovation of the old structure in its vicinity which underwent a complete transformation to pave the way for much-needed facilities like a coffee shop, a bookshop, an art gallery and a theatre. The dilapidated building housed a swimming pool and a squash court, besides a fire station during the British era. The fire station has given way to a coffee shop and a book shop and the swimming pool has been converted into a theatre and the squash court into an art gallery. The new additions have infused “cultural life” and provided a fillip to creative activities, which are mostly connected to academic pursuits and other academic activities at the institute. For instance, during a seminar on Rabindranath Tagore, films based on his works were screened at the theatre for the benefit of scholars. Similarly, poetic symposiums, musical and dance performances, art exhibitions, plays and other such activities are organised in tune with the intellectual and academic activities being held in the institute, says Peter Ronald d’Souza, Director of the IIAS. He was addressing the Shikhar Yuva Samman Samaroh, organised by a literary organisation, Shikhar, here today. Dhumal said efforts were being made to promote art, language and culture, besides preserving the rich cultural heritage of the state. The Chief Minister said literature represented the age it was written in and carried historical contents of art and culture of that period. “Literary organisations have been contributing significantly towards the promotion of various creative activities which have helped showcase the rich culture and traditions of the state,” he remarked. 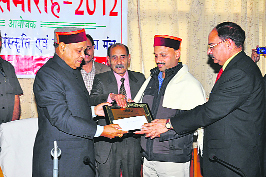 Dhumal congratulated Shri Keshav, president of Shikhar, for organising its annual function and inviting renowned litterateurs from different parts of the country to deliberate upon exploring possibilities of making Himachal Pradesh a centre of art and culture in the country. He also conferred the samman upon Dr Bharat Prasad, writer from Meghalaya. He also released a poetry book, “Virasat Jaisa Kuchh”, penned by poetess Dr Rekha on the occasion. The minister said this while addressing a public meeting at Badhani after inaugurating four rooms in the local Government Senior Secondary School today. The minister said IT education in 884 government schools would be introduced from this session in the state. Dhiman said the state government had put education among the priority sectors of the state government and at present, 19 per cent of the state budget was being spent on education, which was the highest in the country. He said the state was being developed into an education hub and quality educational institutes had been opened, like the Central University in Kangra, HP Technical University and State Hotel Management Institute in Hamirpur, besides 11 private universities being opened in the state. He claimed the government had made every effort to develop roads and work in the health sector in the state in its present term, for which it was getting accolades from the public. The minister also announced grant of Rs 9 lakh as the first instalment to construct a science laboratory in Badhani School and Rs 8 lakh for constructing additional rooms in the school. The students of the school presented a cultural show on the occasion, for which, the minister announced a cash prize of Rs 3,000. This was stated by Deputy Commissioner Ritesh Chauhan while presiding over a meet-the-press programme regarding the progress of works of the District Rural Development Agency here on Thursday. He said now the government had included construction of 3-metre paths in villages under the MNREGA and this would help in fulfilling the demand of several areas in the district here. Though 26 per cent jobs were of such village paths, with lesser width. Chauhan said though response for jobs under the MNREGA was not encouraging here due to several factors, over 50 per cent of women had turned up for these jobs. He pointed that any below poverty line (BPL) family that had lost houses in natural calamities were entitled to apply for a house constructed under the Indira Avaas Yojna and at present seven such houses had been allotted in such cases in the district. Earlier, District Rural Development Agency project officer Bhumi Singh Bhandari gave details of various achievements of the agency and said a rural building material centre and a water filter project were already functioning at Lakhanpur near here and steps were afoot to shift the waste paper recycling unit to some suitable place. Sukhev Jamwal, president of the sabha, rued that this FWP being prepared after every 15 years had been introduced during the British era in which the entry of “Khudrao Darkhtan Malkiat Sarkar” had been causing a huge loss to farmers in Kangra, Hamirpur and parts of Una districts in the state. He said the preparation of the new working plan due from March 2006 was underway and it was the right time that the Chief Minister should take requisite steps to ensure the removal of anti-farmers’ entry. The then Dhumal government in 1999 had issued a notification for vesting ownership rights of trees to land owners, but it was turned down by the government of India by raising a few objections. But the successive as well as present state government didn’t take any steps to remove those objections during the past 14 years. Farmers in the neighbouring Punjab were facing a similar problem of ownership rights of trees grown on their private land under the Punjab Land Preservation Act, 1900. But the Badal government took the pro-farmers’ cause with the government of India and even approached the apex court and succeeded in excluding area in the Forest Working Plan. The Punjab Government had issued notification No.39/578/2005-FT-111/6085 on August 13, 2010. The local Block Development Committee comprising 12 gram panchayats passed a resolution for excluding around 7,000 hectares of private land from the FWP in Nurpur forest division on March 12 last. Centres (HRRCs) located in the Obstetrics and Gynaecology Department of different medical colleges. He said these centres had now been re-designated as field units of NIRRH-ICMR as per the revised mandate. The network of the 31 HRRCs established in different parts of the country had been engaged in conducting clinical, operational and action-oriented research in areas of national priority, Katoch added. He said each centre submitted a research proposal to the ICMR for grant-in-aid projects of national, state or regional relevance. He disclosed that an apex committee meeting on HRRCs had recommended the establishment of new field units in states which were unrepresented earlier. He said Dr Anil Chauhan, Principal, DRPGMC Tanda, had been asked to establish a centre wherein the Departments of Gynaecology and Obstruction (OBGY), Pediatrics and Preventive and Social Medicine of this institute would jointly come together to form a unit. Dr Chauhan said the unit was set up in TMC following direction from the ICMR chief. Revealing this here, Chamba SP Kuldeep Sharma said a team of police officials, headed by ASI Nasib Singh, had succeeded in arresting the accused near Sidh Mandir in the Purthi area of the Pangi valley on Wednesday at around 2 am in a short stint of 12 hours from the shooting incident in which the girl was grievously injured and later succumbed to her injuries on way to the hospital. During investigation, a ‘katta’ (local handmade firearm), along with two live rounds (shells), had been recovered from the possession of the accused. He had purchased these from Hyderabad, the SP said, adding that Sumit was a resident of Bulandshehr in Uttar Pradesh and had been working with a private company at Baddi in Solan district. A case under Section 302, Indian Penal Code, and Sections 24.54 and 59, Indian Arms Act, had been registered at the Killar police station. The rally started from Birta on the outskirts of this temple town and passed through the new bus stand, Dharamsala road, Tehsil Chowk, Nehru Chowk, main market and college road and culminated at the State Bank of Patiala Chowk. Girls outnumbered boys in the rally. Carrying placards and banners, participants raised slogans against female foeticide. Girls in vehicles were raising slogans and singing bhajans. The rally was organised by Apex Computers, Matour, in collaboration with the Vivekananda Kendra, Kanya Kumari branch, Kangra, a spiritually-oriented service mission. Addressing the gathering at Nehru Chowk, Ashok Kumar of Vivekananda Kendra said India had a tradition of worshipping women as mother based on the philosophy of “Materi Devo Bava”. Amit Choudary, Director, Apex Computers, and Madan Verma also addressed the gathering. The two victims have been identified as Chattar Singh of Ladwan and Master Raman Singh of Hayun Durbal in Himachal. Out of the 28 injured, 20 were discharged after being provided treatment at the Raipurrani Public Health Centre, while six persons were referred to Sector 6 General Hospital. One of the two seriously injured Channi Devi has been referred to the PGI, Chandigarh, where her condition is stated to be serious. The incident occurred when the driver fell asleep and the bus hit a tree and rolled into a dry pond at Manaktabra village at about 4.15 am. People living in the area reached the spot and removed the injured from the bus, besides calling ambulance helpline No. 102. There were 42 passengers in the bus at the time of the incident. Stating this at the annual prize distribution function of Government Polytechnic for Woman , Kandaghat, Health and Ayurved Minister Dr Rajeev Bindal said expansion of technical and professional education had helped create more job opportunities for the state’s youth.He said for the first time, hydro-electric engineering education will be provided and students will thus find ready employment in various hydro-electric projects in the state. In his address, Pandey explained that the mission was one of the eight missions under the national action plan on climate change and the total cost of the project was Rs 46,000 crore for the country. He said this mission would be completed within 10 years and 10 million hectares area would be developed into a forest by restocking and planting trees on it. Four forests circles i.e. Dharamsala, Hamirpur, Bilaspur and Mandi had been selected to be included in this project, he said. Forest officers from Hamirpur circle attended this workshop. Meena Devi, 35, wife of Ram Kumar, a Nepali national at Jaterd in Mandi district, had received 90 per cent burn injuries when her house was set on fire allegedly by Jasvir Singh of the same village at night. She was admitted to DRPGMC Tanda in a critical condition and in her dying statement she alleged that Jasvir Singh had set her house on fire at about 2.30 am when her husband was not there. In another case Sandla Devi, 25, of Kathroli Jawali village had received 60 per cent burn injuries when she her clothes caught fire while working in the kitchen. Leaders of the Unemployed JBT Teachers’Association said there was no such provision of qualifying TET in the 2007 notification of the state government when they had been admitted to undergo the JBT training. “There was no clause about the TET with regard to the admission to JBT classes issued by the state government,” they said. Addressing the inaugural ceremony, he exhorted book-lovers to take benefit of the week-long book fair where bestselling editions by different publishers were on display for sale and exhibition. He said NBT had been established by the first Prime Minister of India, Pandit Jawahar Lal Nehru, with a view to provide readers quality reading material at affordable price. A 25-year-old youth died of poisoning at DRPGMC Tanda today, the police said here. Identified as Kashmir Singh of Fandal village, Hamirpur, had consumed some poison and was rushed to Hamirpur hospital. In view of his critical condition, Kashmir was referred to the DRPGMC Tanda last night where he died this evening.